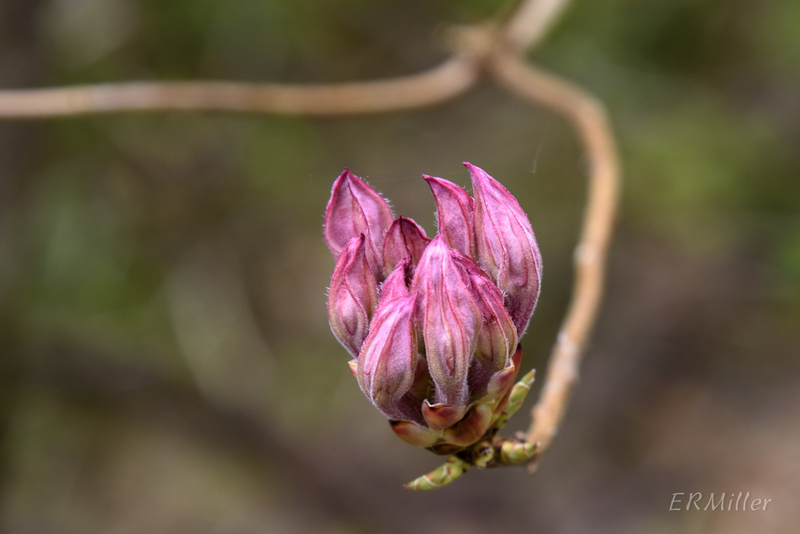 About ten days ago I read that the pinxters in Rachel Carson Conservation Park were in bud. A few days later, I went to have a look, but only a few were open. A few days after that, I went back and found them fully open, glorious splashes of pink blossoms among the pale green of new leaves on other trees. 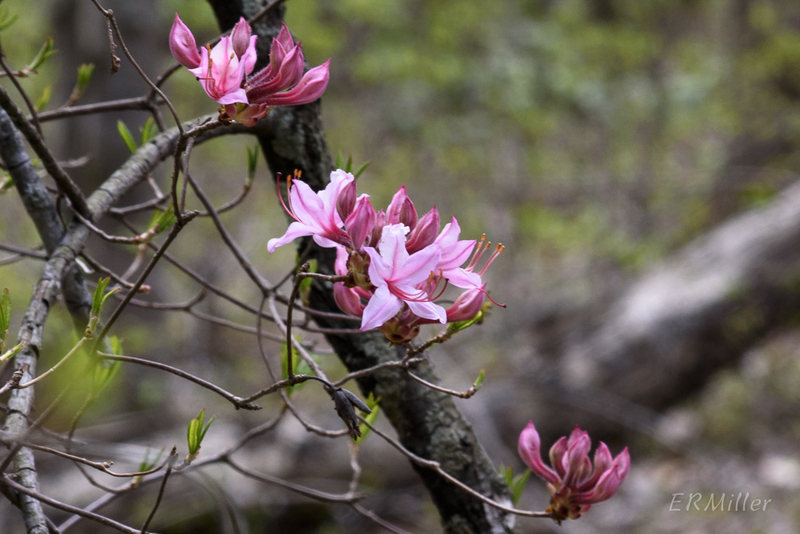 There are thirty two native species of Rhododendron in the continental US. 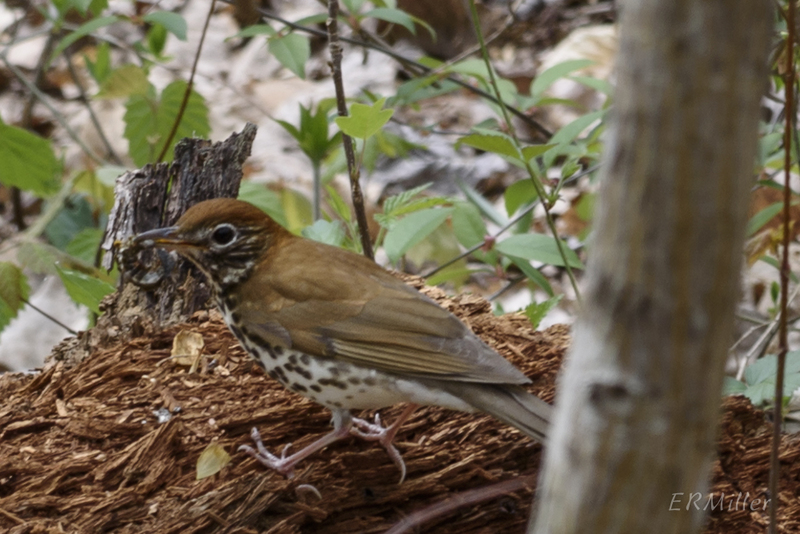 Seven of these occur in Maryland, mostly in the western counties or on the coastal plain. Three species are found in the piedmont. This species is a deciduous shrub growing to twelve feet tall (usually less). Like most ericaceous plants it prefers moist but well-drained acidic soils. 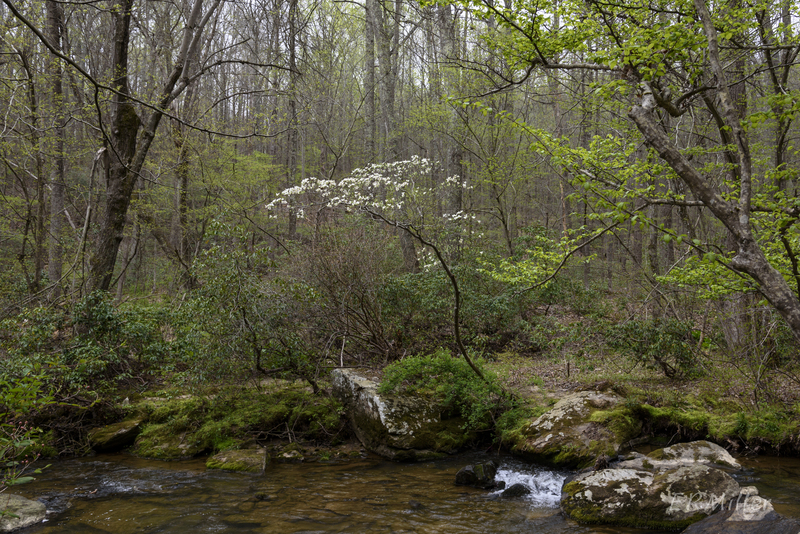 At Rachel Carson you can find it near rock outcroppings and along the shore of the Hawlings River. Supposedly pinxter is a fairly common plant, but I’ve never come across it before. I’ve read that it can be found on Sugarloaf Mountain. Guess I need to get back there soon. It’s listed as endangered in New Hampshire, expoitably vulnerable in New York, threatened in Ohio, and special concern in Rhode Island. About the name… According to Cookies, Coleslaw, and Stoops: The Influence of Dutch on the North American Languages (Nicoline van der Sijs, Amersterdam University Press), the word “pinxter” comes from the word “pinkster”, the Dutch name for the religious festival known in English as Pentecost. You can read more about that here. The more I looked at this flower, the more fascinated I became by its structure. 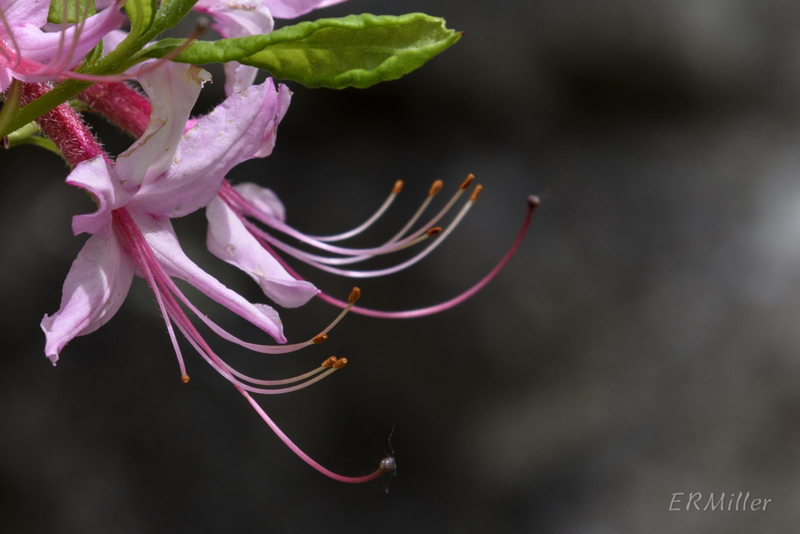 Note the five stamens and one very long pistil per flower. In general, plants in the Ericaceae have twice as many stamens as petals (typically ten stamens and five petals, but not always). 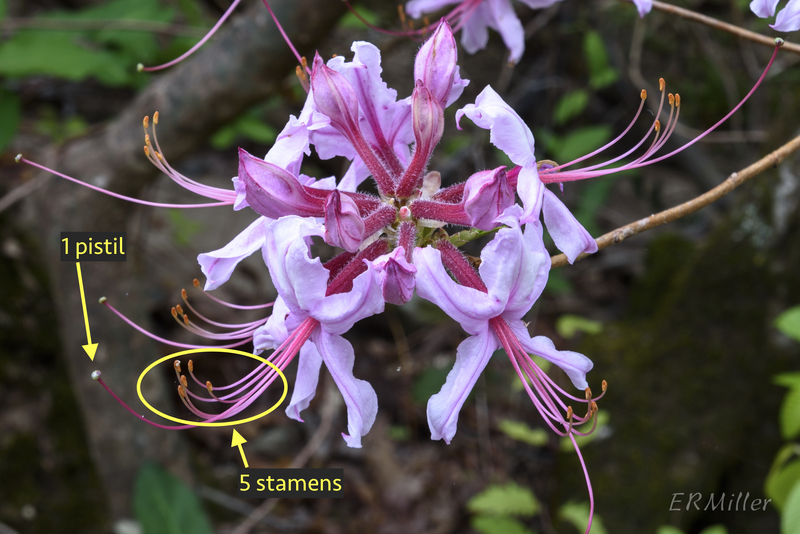 It took awhile but I finally read that the North American azaleas are an exception to this rule, having the same number of stamens as petals. 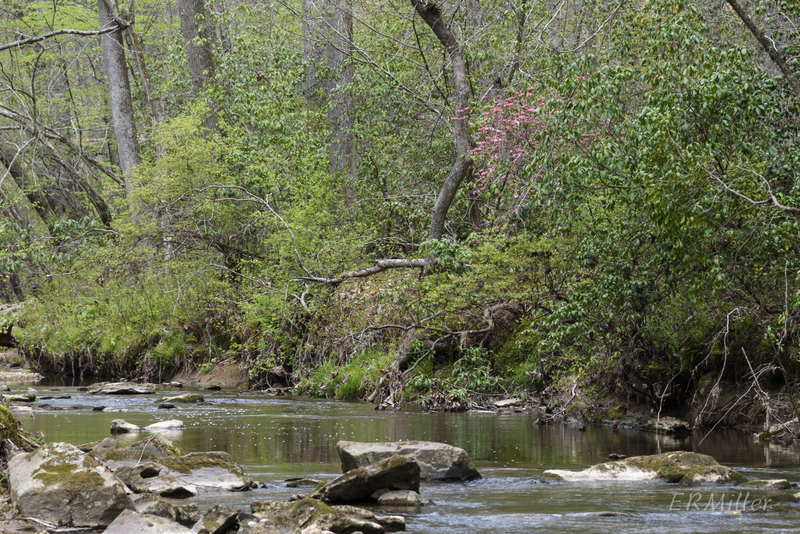 Along the banks of the Hawlings River in northeastern Montgomery County lies a 650-acre area called the Rachel Carson Conservation Park. 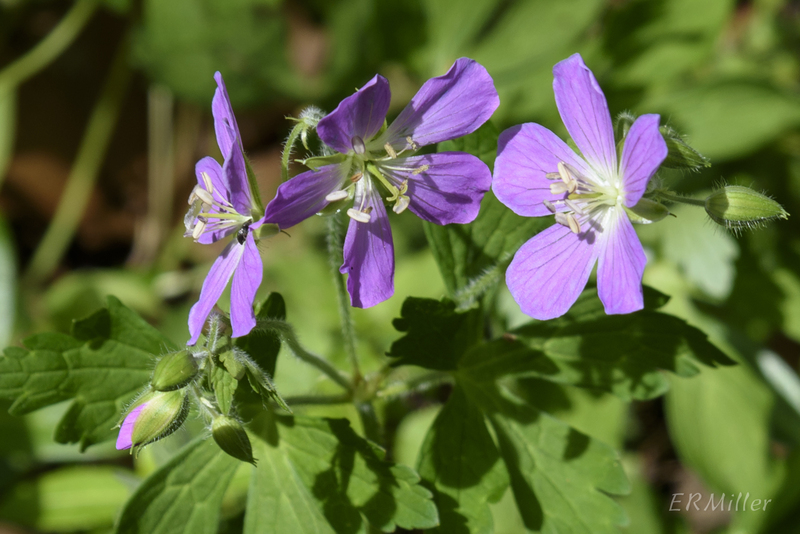 The park has no facilities, just a few interpretive signs and about six miles of natural-surface trails through the rolling woods and meadows. Among local native plant enthusiasts this park is known primarily for its pinxter flower azaleas, and that was reason enough for me to go. But I was pleasantly surprised by how nice the area is. By “nice” I mean not full of people and trash, and not over-used. I found some wonderful flowers and plants other than the azaleas, including two species that I had never seen before. 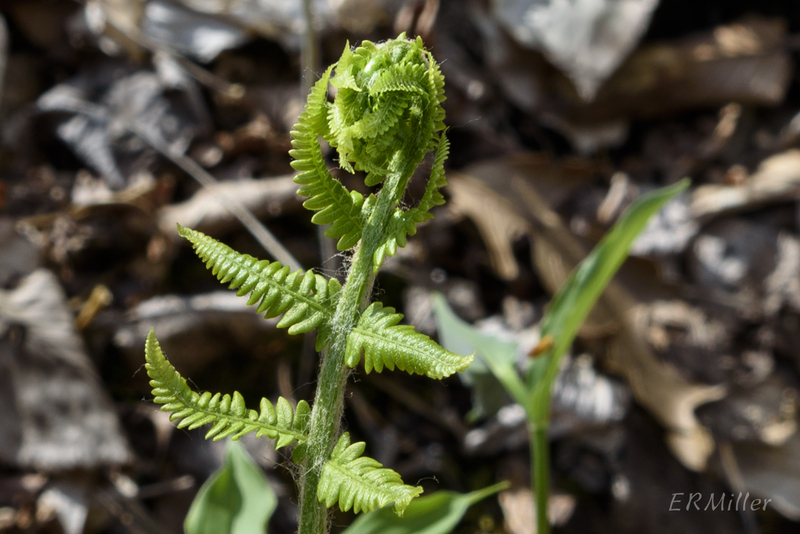 This always makes for a great day but one of the species was an orchid, which catapults Rachel Carson Conservation Park to the top of my favorite places list. Animal viewing was good, too. There was a wild turkey that I couldn’t get pictures of; I was making notes at the time and those birds move fast! There were lots of spicebush swallowtails but they didn’t sit still for more than a second. see the pink shrub peeking out? More about the plants in the next several days. The season is progressing rapidly: many of the ephemerals are gone already. 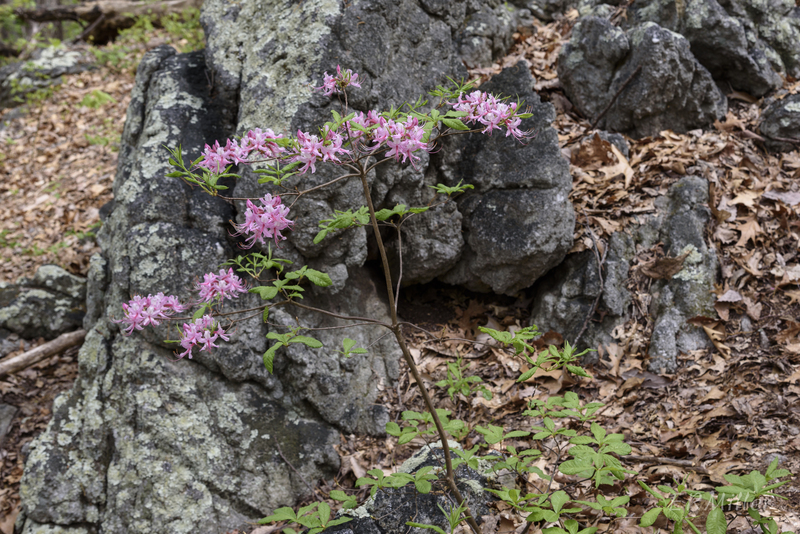 When I visited the greater Carderock area on April 25, a few new species were in flower, all about a week and a half to two weeks earlier than last year. The table mountain pine is endemic to the Appalachian Mountains, where it’s found mostly in the Ridge and Valley and Blue Ridge physiographic provinces. 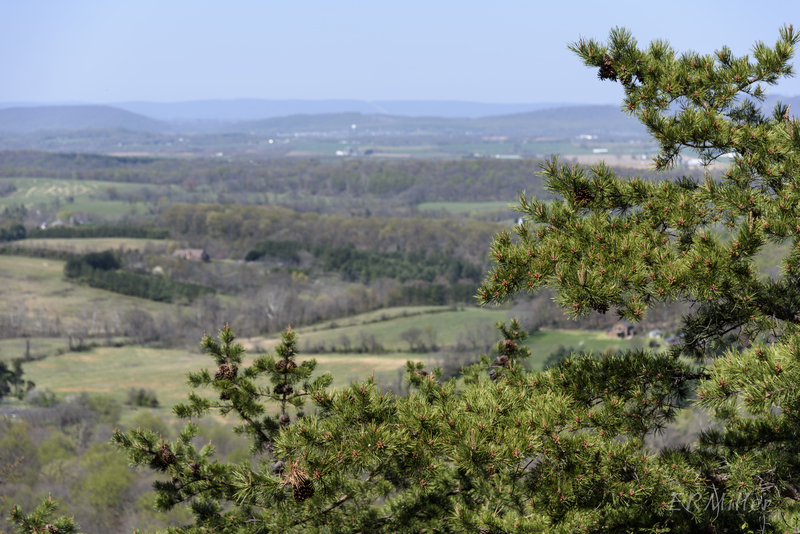 In Maryland, that includes Frederick, Washington, and Allegany Counties, though there are no records of table mountain pine in Washington County. This specimen was found at White Rocks in the Sugarloaf Mountain Natural Area, which is actually in the Piedmont province, though at the westernmost part, right at the edge of the Blue Ridge province. Table mountain pine grows slowly, with a rather crooked, many-branched habit, and is often flat-topped. 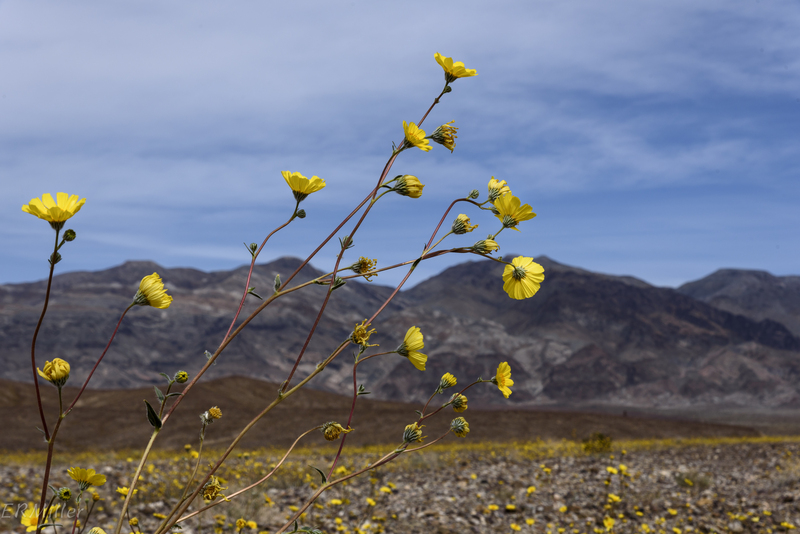 It rarely grows taller than 60 feet, although the tallest on record was 94 feet. It prefers exposed, rocky sites (like White Rocks) where there’s little competition from other trees. The seedlings actually take root in rock crevices. Identifying it is fairly easy, as there aren’t too many pine species in Maryland. The fact that it’s 2-needled and has spiny cones helps, along with noting the habitat. 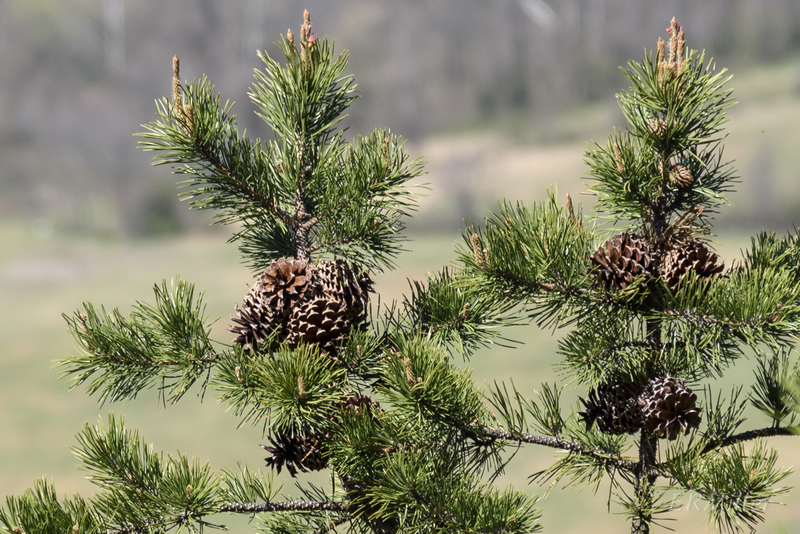 More on pine identification (and an explanation of “2-needled”) in a future post. So who knows? Though the second source sounds authoritative. I could probably spend the rest of my life exploring the Potomac Gorge and still never learn everything about it. But there are other interesting natural areas nearby, and I’ve sworn to spend more time exploring them, and less time in the gorge. So I decided to start with an old favorite: Sugarloaf Mountain. “Mountain” is relative, since the peak is only 1,282 feet above sea level, but it is about 800 feet above the surrounding land, and the only place of elevation of any sort east of the Blue Ridge, so “mountain” it is. 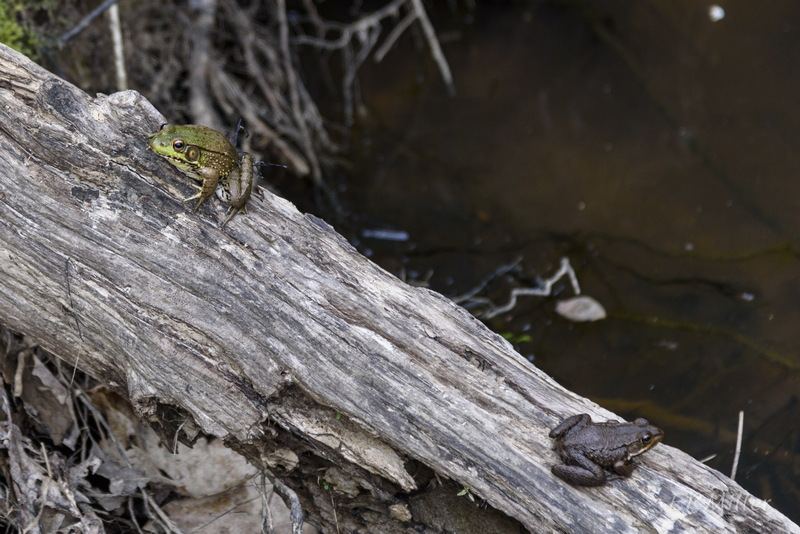 It’s located in southeastern Frederick County, a few miles northeast of where the Monocacy River meets the Potomac. It’s near the western edge of the Piedmont physiographic province. The really unusual thing about Sugarloaf is that it’s a privately owned park that’s open to the public year round, sunrise to sunset. Development has been minimal: there’s a one-way road up to near the top and back down, three parking areas (and one at the base), some picnic tables and portable toilets, and a nice network of heavily used, very worn trails. Sugarloaf was my playground back in the ’80s and ’90s. It was one of the places I went when playing hooky from high school (when I had a car available). I went hiking on it with my best friend the night of our senior prom. After college I had a job nearby and often hiked there after work. But as time went on and I moved further away I spent less and less time there. Last weekend Steve and I went back, for the first time in many years, and of course I kept my eyes open for wildflowers. I went back two days later without him to do more detailed exploring. Everything that was blooming was about two weeks later than in the Gorge. Here’s a list of finds; only the ones marked with an asterisk were actually blooming. 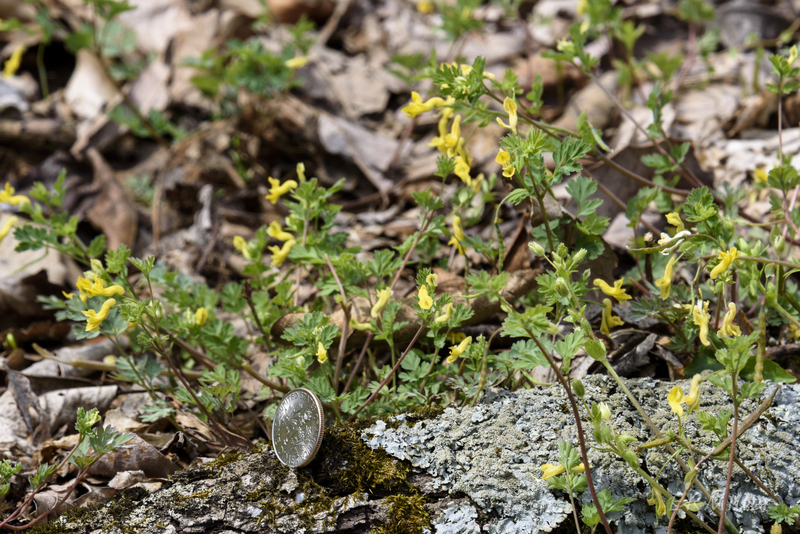 Short-spurred corydalis (Corydalis flavula, left, with dime for scale) was by far the most abundant of the flowering plants, which is interesting because it’s described as “uncommon” on Sugarloaf by Choukas-Bradley and Brown in their excellent book Eastern Woodland Wildflowers and Trees; however, the book was published in 2004. A lot can change in twelve years. There were plenty of ground pines and ferns, too, including ebony spleenwort and Christmas fern, and several others that I’ll have to go back to identify once they’ve grown a bit more. 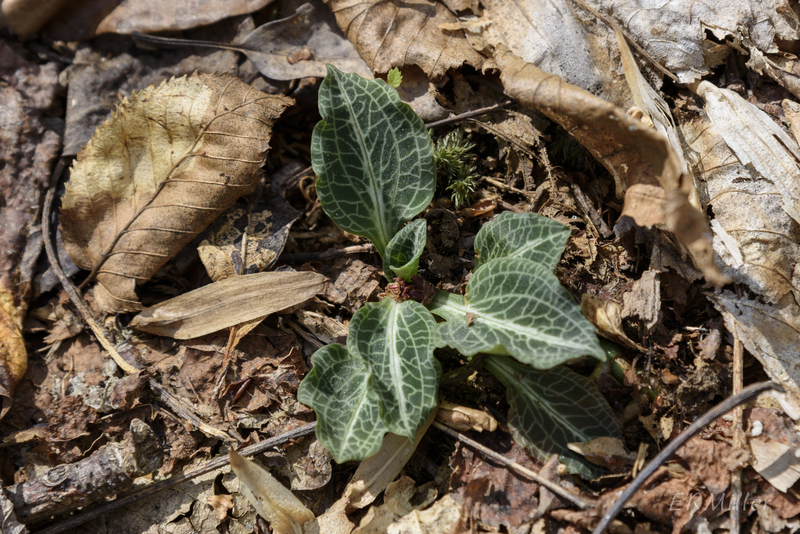 Most exciting, for me, is the downy rattlesnake plantain (right), a native orchid that I had never seen before. 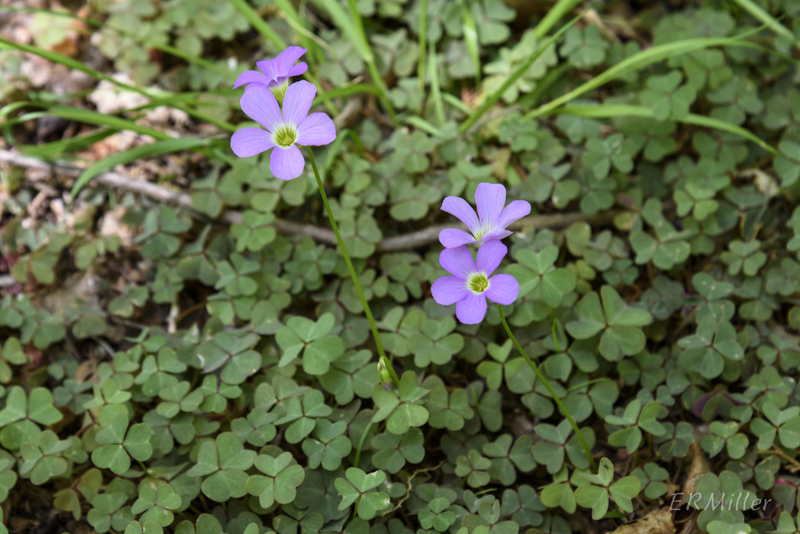 The distinctive leaves make it easy to identify. About the lead-in photo… White Rocks is actually an outcrop on a hill (800′ above sea level) that’s part of the Sugarloaf Mountain natural area, but not part of the mountain proper. The tree In the foreground is a table mountain pine; more about that next time. 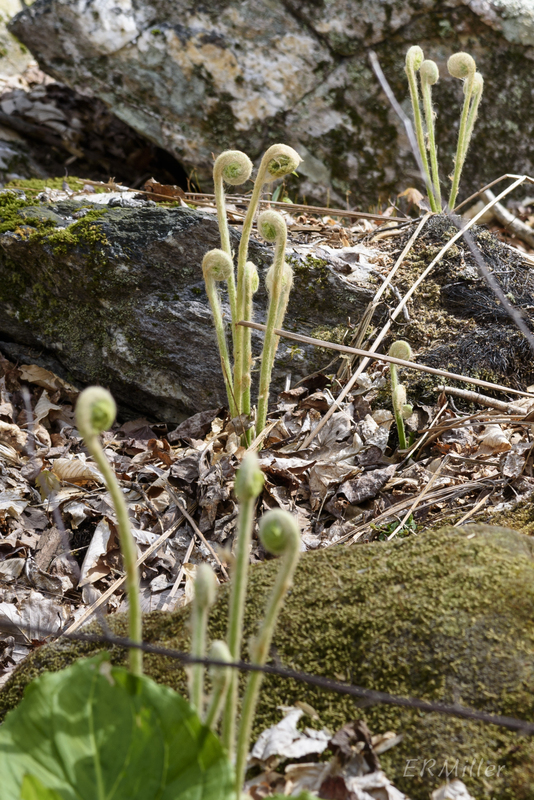 It’s a good time of year to be watching for emerging fiddleheads, also called croziers. Here’s a random assortment of some I’ve found, including several that I haven’t identified; that will probably have to wait for fertile fronds to emerge later in the year. I just love this one; it looks like a dragon or alien monster or something. 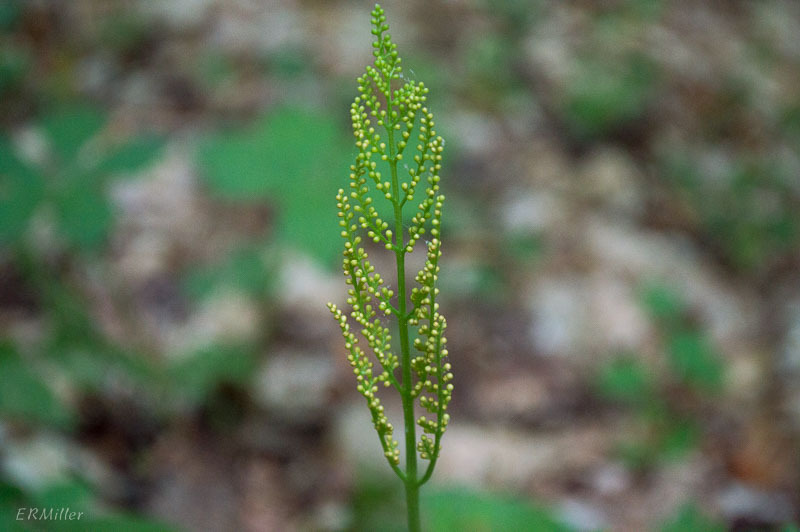 This fern is all over the place at Sugarloaf Mountain and Rachel Carson Conservation Park; I expect it’s one of the Dryopteras. 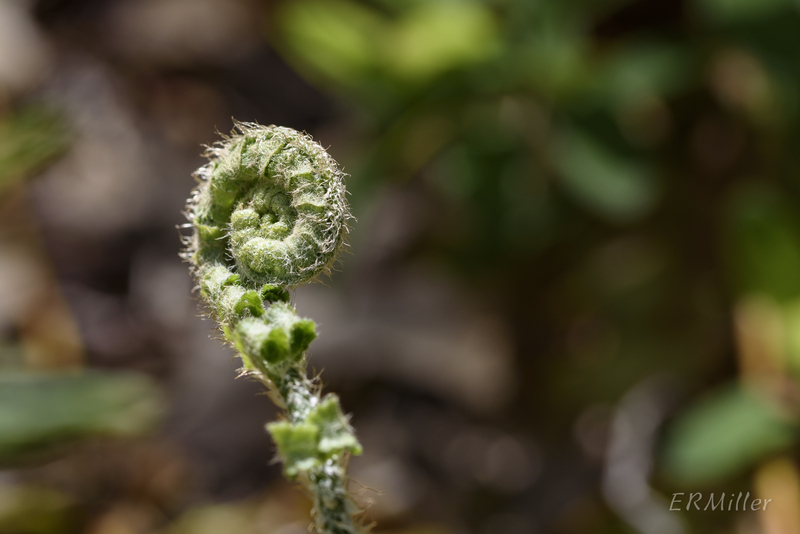 It is not one of the evergreen ferns. Christmas fern (Polystichum acrostichoides), below, is easily identified because it’s so hairy. Another unknown (right and below); I’ve been seeing it in wet areas in parts of Montgomery County other than the Potomac Gorge. 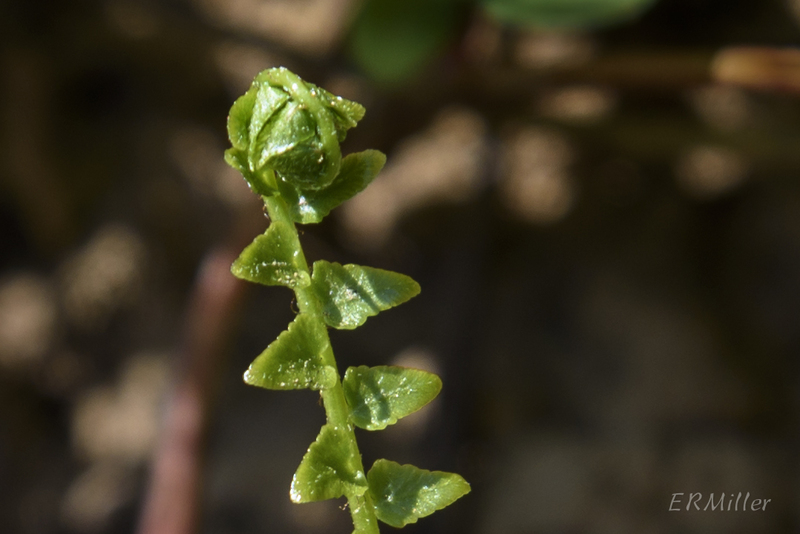 Right, one of my favorites: ebony spleenwort (Asplenium platyneuron). 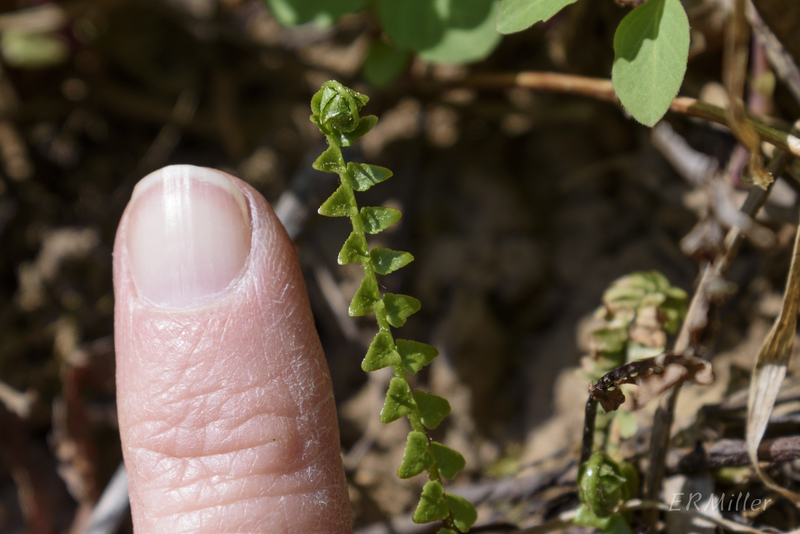 Below, a forefinger held up to the same plant. And this one (right) was a good find. 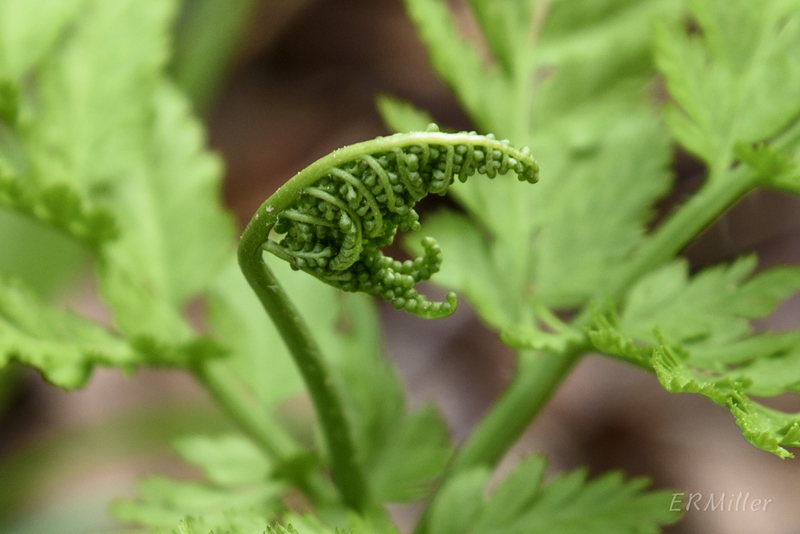 It’s the fertile frond of a rattlesnake fern (Botrypus virginianus), which I’ve only seen once before. You can see the spherical sori contained within. 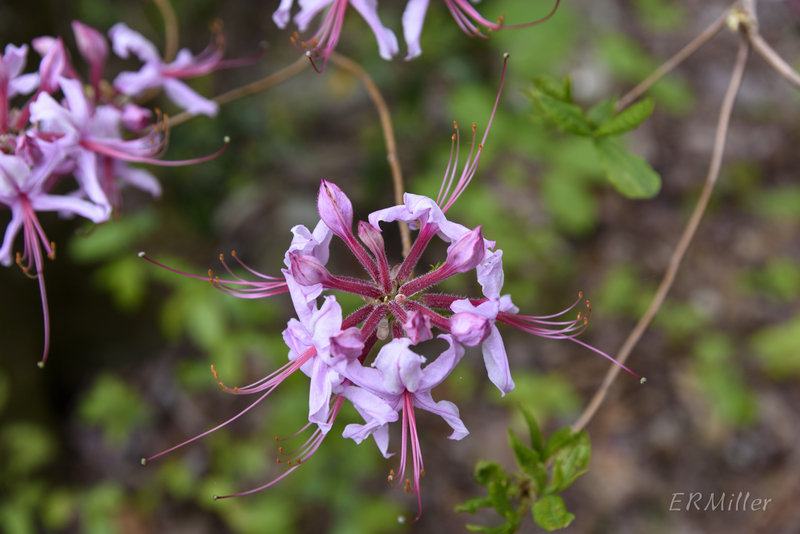 This plant was in Rachel Carson Conservation Park, where I went to see the pinxter azaleas in bloom. (More on that in a few days.) 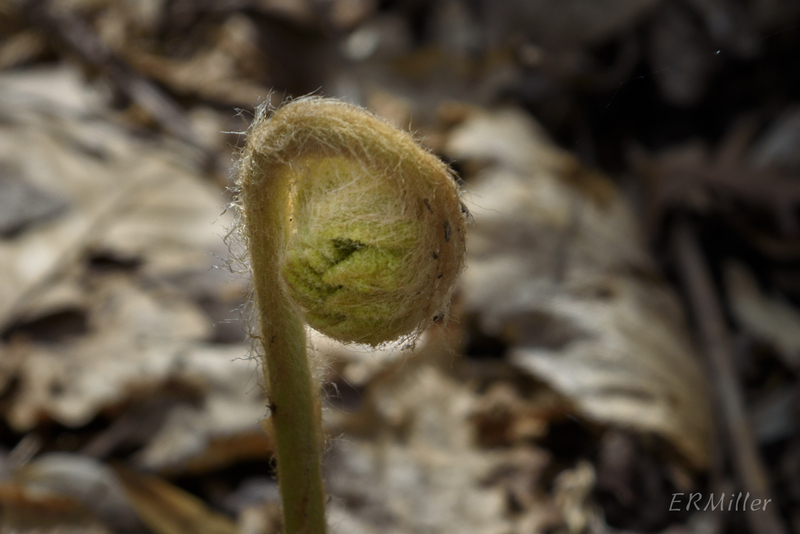 Below is a picture from last year, showing the fully developed fertile frond. This neat little plant is not quite a belly flower: it is very low growing (five inches tall at most), but it can spread pretty wide. 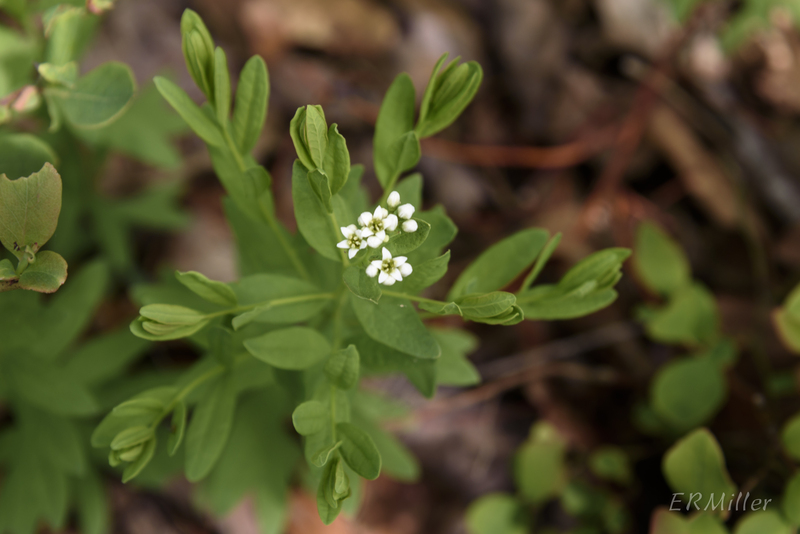 It’s variously described as a small shrub, annual forb, or short-lived perennial. 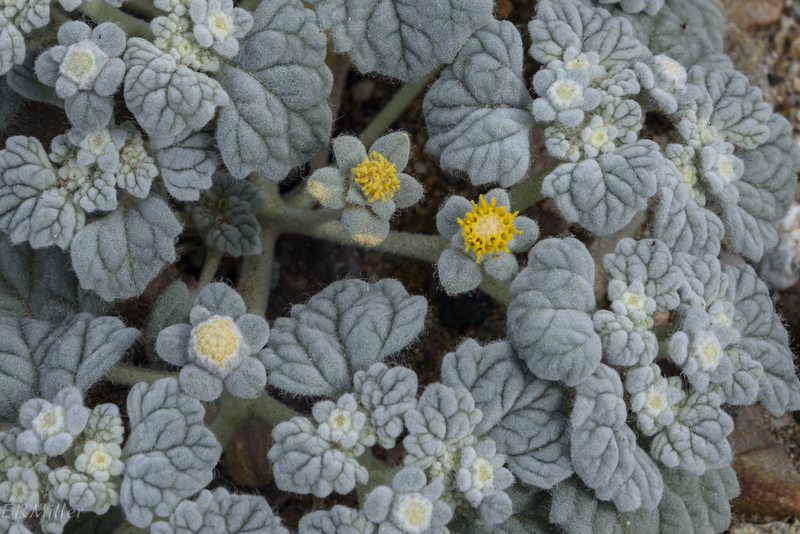 On many desert plants, the foliage is as attractive as the flowers, and so it is here: thick, fuzzy, silvery sage-green leaves are mounded so as to resemble the back of a turtle. The inflorescence consists only of disk flowers (no rays). 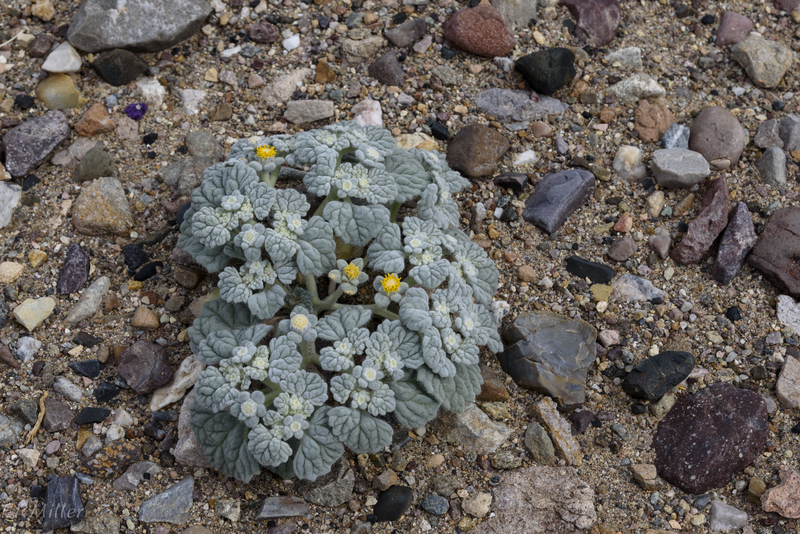 Apparently it’s pretty common in the Mojave desert at low elevations, but for some reason I saw only this one plant, in a wash near Beatty Road. And that’s it for the Death Valley report. There are a few more plants that I haven’t positively identified yet (five of them probably Cryptanthas), and I don’t have great pictures of them. There are still about 200 landscape photos to go through; eventually I’ll be posting a dozen or two of them on my other website (ermiller.smugmug.com).